Due to The Philanthropy Roundtable’s Annual Meeting this month, our next newsletter will be published on November 2, 2018, followed by a special edition newsletter after midterm elections, published on November 7, 2018. The House adjourned last Friday for a month-long recess until after the midterm elections, but before leaving Washington they passed a Tax Reform 2.0 package, which consists of three separate bills: the Family Savings Act; the American Innovation Act; and the Protecting Family and Small Business Tax Cuts Act. All three bills passed with bipartisan support with a couple Democrats voting in favor. Some Republicans in high-tax states voted against the Protecting Family and Small Business Tax Cuts Act, which focused on making permanent the individual tax cuts, partly due to the cap on the state and local tax deduction being made permanent. One provision in the bill would make permanent the 60 percent AGI limit on charitable deductions for cash gifts, which was bumped up from 50 percent, and would fix the “glitch” that causes the limit to decrease if non-cash gifts are claimed. Although the package passed the House, the Senate has indicated they likely won’t take up the 2.0 package this year. However, there are provisions in the package that could be included in an end-of-year tax bill, and we’re working to get the glitch fix included. ACR recently convened several stakeholders in the sector to discuss the best strategy to collectively weigh in with Treasury on new rules the department is thinking through that would impact donors and their donor-advised funds (DAFs). You may recall, in December of 2017 the Treasury Department issued a Notice that included proposed regulations for DAFs and also requested comments on how they are used by individual donors and private foundations. Specifically, the proposed regulations address bifurcation, pledges, and public support. The Notice also asks for comments on how private foundations use DAFs in support of their purposes and if a contribution to a DAF from a private foundation should be treated as a “qualifying distribution” for the 5 percent payout requirement only if the sponsoring organization agrees to distribute the funds within a certain time frame. To see a great write-up on the Notice, read this. The ad hoc group intends to meet with Treasury by the end of the year. Let us know if you’re interested in participating in the group. As you may recall, ACR has been coordinating in-district meetings with key lawmakers to discuss the universal charitable deduction. 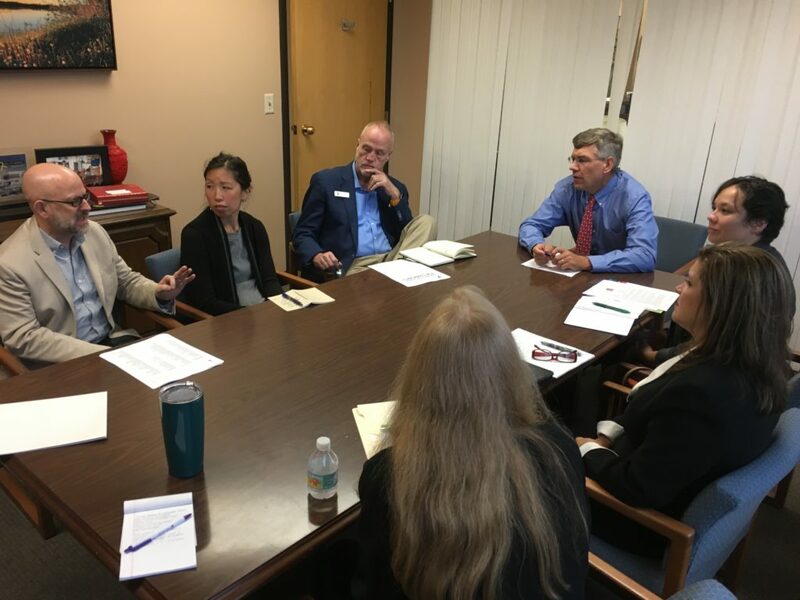 Last month, we convened a group of nonprofit leaders in Eden Prairie, Minnesota to meet with Rep. Erik Paulsen (R-MN). Rep. Paulsen acknowledged the potential decline in charitable giving post-tax reform and committed to helping the sector address the problem should data show a decrease in giving next year. Last week, Rep. George Holding (R-NC), along with Reps. David Rouzer (R-NC) and Tom Rice (R-SC), released legislation that would offer tax relief for victims of Hurricane Florence. The Hurricane Florence Tax Relief Act would give temporary tax relief to both businesses and individuals who are facing recovery, while also temporarily suspending limitations on the charitable deduction for contributions associated with hurricane relief. A similar bill was passed in 2017 after Hurricanes Harvey, Irma and Maria so, we can expect some version of this bill to be included in an end-of-year tax bill. Some of you may know of the work of the Community Foundation Public Awareness Initiative, an effort in Washington to help more policymakers understand the work and unique contributions of community foundations. In an effort to help the general public and those in the media understand community foundations and what they do, the Initiative added a communications component in 2018 and just launched a new website, which can be found here. If you have thoughts on the website or would like more information about the Initiative, please e-mail sbarba@urbanswirski.com and we will put you in touch with the organizers of the effort. Daniel P. Schmidt, former vice president for program of The Lynde and Harry Bradley Foundation, and Michael E. Hartmann, senior fellow and director of the new Center for Strategic Giving at the Capital Research Center, authored an article about recent legislation in California that would create certain requirements for boards of private and publicly traded corporations, and what that could mean for foundation boards down the road. You can find the full article here. The ultimate goal of the legislation is to decrease the cost of higher education – a laudable goal. But the way in which the legislation seeks to reduce those costs takes aim at a key component of civil society: philanthropic freedom. This isn’t the first time lawmakers have suggested some charitable missions are more worthy of a charitable deduction than others, and we don’t expect it will be the last. But it starts us down the road of introducing politics into philanthropy – something philanthropists have avoided and fought against for over 100 years. Lawmakers determining which kind of giving is “real charity” and which is not violates the clear line that separates government and civil society. The beauty of philanthropy in America is the freedom donors have to give away their money – with no benefit to themselves – to address problems in their communities. We hope current and future lawmakers will recognize the critical importance of philanthropic freedom and tread carefully when legislating in this space.